Worried that you may have missed the boat and your chance to win one of these fantastic new illustrated wall maps by Tania McCartney? Fear not. KBR is here to help you travel the world with this new-release map by our very own KBR Founder, Tania McCartney! Thanks to Hardie Grant Travel, we have a very special copy of this beauty to give away. For curious adventurers who never stop exploring, this stunning, large-format map is a modern take on exploring the world, from the highest mountain to the deepest surrounding sea. Showcasing more than 300 individual illustrations of flora, fauna, landmarks and attractions from around the globe, intricate details could keep anyone enthralled for hours. Watercolour illustrations combine with digital art to create an eye-boggling journey, and a priceless resource for schools, libraries and organisations. It would make a striking piece of artwork for any child's (or adult's!) room. Learn more. For your chance to win, tell us, in 25 words or less, why travel is so wonderful for children. Email your answer along with your name and postal address to dimity. 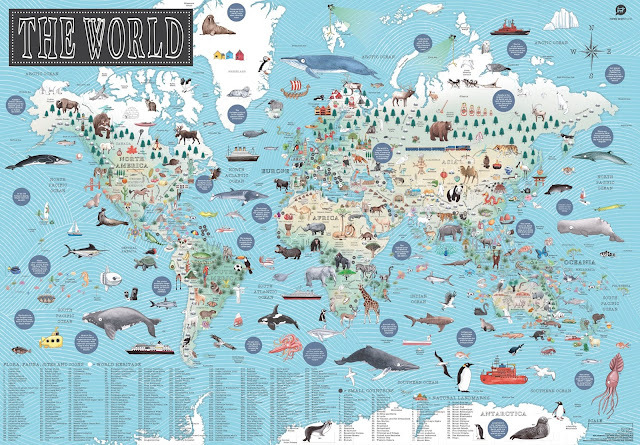 The response we like the best will win a copy of the illustrated wall World Map. Competition is open to anyone, worldwide, so long as they have an Australian postal address for delivery of the prize. Please note, we cannot deliver to PO Boxes. Entries without a name and street address will be ineligible. Winners will be announced right here on our website on Sunday 10 June 2018. Competition runs from 5pm Monday 4 June to 5pm Friday 8 June 2018. Adults can enter for those aged 17 and under. This is a game of skill, not chance. The judge’s decision is final and no correspondence will be entered into.